You are currently browsing the category archive for the ‘Arts & Crafts Impressions’ category. Only 8 more shopping days til Christmas, depending on your threshold for braving the shopping malls. Are you in need of any last minute ideas for your holiday shopping? 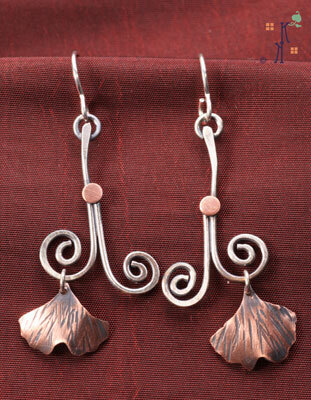 How about a pair my Ginkgo Leaf earrings from my Arts & Crafts Impressions line? I’m offering free shipping via Priority Mail in the continental US only. You can shop from the comfort of your home or other location via computer! If you see a pair you would like to give as a Christmas gift, I would strongly recommend ordering them no later than Sunday, December 18th so that I can ship them by Monday, the 19th. All of these earrings are light weight, which my clients really like. No two pairs are exactly alike. 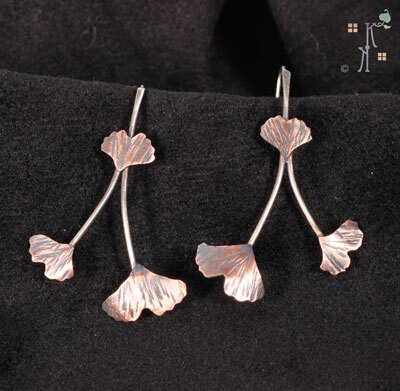 I cut out each individual Ginkgo leaf so they are very natural, just like you would find in nature! 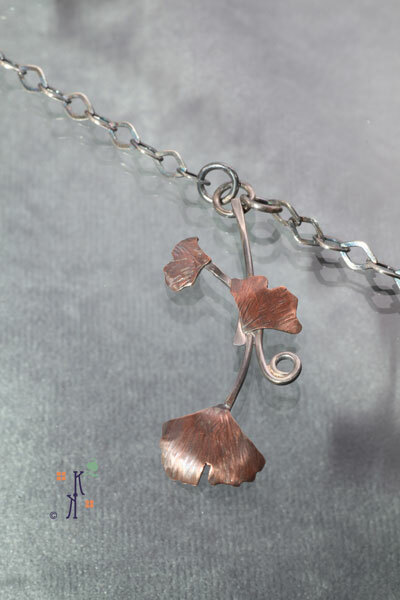 The Ginkgo leaves are copper with a bit of oxidation to emphasize their textures. 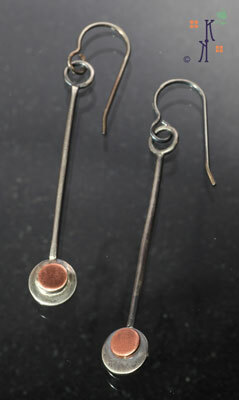 The rest of the earrings are sterling silver, including the ear wires. I did not do a high polish on the silver sections because I thought adding an oxidation to them would compliment the coloration of the copper leaves. Hopefully one of these will speak to you as a nice gift for someone in your life. If you have questions about any of these, leave them in the comments section and I’ll respond. Currently, I am working on a Storefront where you can buy more of my work through my Facebook Fan Page. However, I have run into a few technical difficulties and you can imagine how frustrating that can be for a techie like myself. I will continue to work on that and make an announcement here when I have that Storefront up and running. One of the positive things that came out of me being one of the artists at the Castle Rock Fine Art Festival this September was two members of Commonwheel Artists Co-op stopped at our booth. 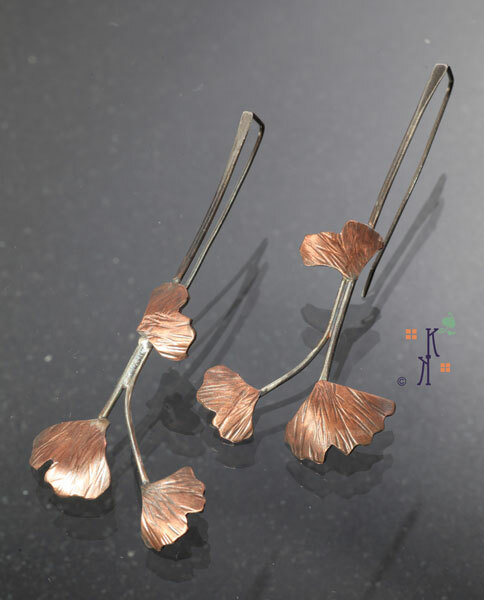 They liked my mixed metal Ginkgo leaf earrings, bought a pair, and invited me to participate in their Holiday Market that starts today, November 18th and runs through December 31st! 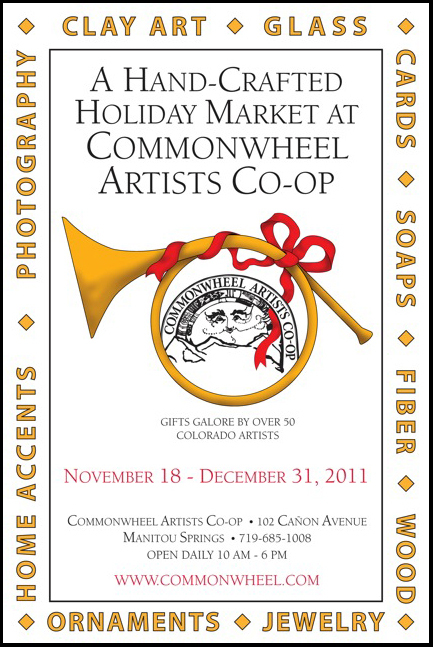 Commonwheel Artists Co-op is located in Manitou Springs, CO and is a group of wonderful, talented artists….some of whom I actually know! I am very happy to be part of their Holiday Market this year. I thought it would be fun to share some of my latest Ginkgo leaf earring variations that will be available at Commonwheel for Holiday gifts. They are part of my Arts & Crafts Impressions series, which originally debuted at the Boettcher Mansion’s Gathering of the Guilds this past May. 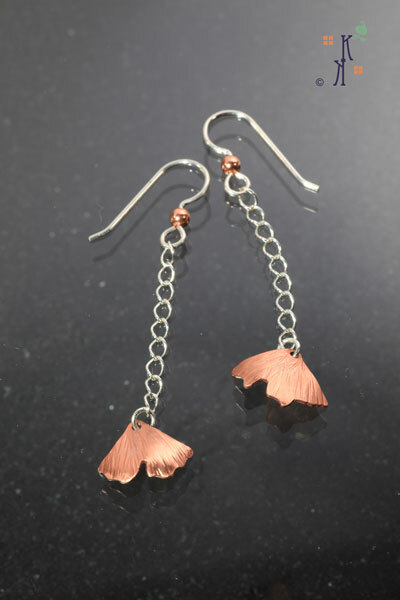 As I started to work on these, each one sort of evolved or morphed into another variation….all of which started with one simple little three leaf design. I am finding it fascinating how an idea will take root and grow during the creative process. I’ll let Dan’s photos do the rest of the talking in this post. A few more from my new Arts & Crafts Impressions. Dan really loved the simplicity of this pendant. I even carried the circle theme on this one through to the bail at the top. I think in its simplicity it is very elegant. The whole less is more idea. While I didn’t necessarily make these earrings to match the pendant, I think they are a very nice compliment, if you are looking for a set. I actually made these first and then as I was working on some of the other circle pendants in this series, everything just started to come together. It’s nice when that happens, isn’t it? This was the first time, since I started metalwork, where I really didn’t do a sketch for each item in the series. I was able to visualize what I wanted to do and just started cutting out the metal and putting the pieces together. I felt a real sense of direction once things started to gel and lead the way. I know that it was more feasible to work without specific designs given the clean lines of these pieces. I found it rather freeing to just work without the use of sketches. I know that won’t always be the case, yet it does open some nice possibilities for letting future work evolve and take its own wings. Currently, I’m experimenting with some new ideas that will lend themselves to another series….but that discussion is for another time. I’d like to start this post with wishing everyone a very Happy Mother’s Day. It is a beautiful, sunny spring day here in Colorado and I hope many of you are able to be out and about, enjoying this day with friends and family. 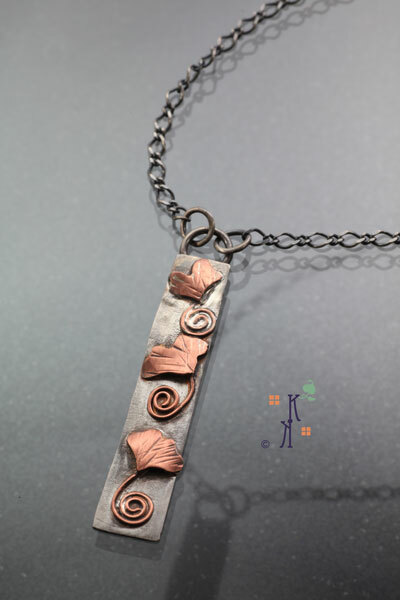 Ginkgo Branch is a pendant in my new Arts & Crafts Impressions series. I am happy to report that the new series was well received last weekend at the Arts & Craft’s Society’s Gathering of the Guilds at the Boettcher Mansion. 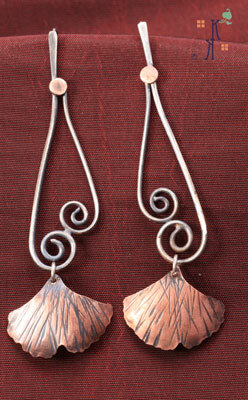 My Ginkgo earrings were my most popular item and I sold several pairs. For me, that is a wonderful affirmation of my work. I thoroughly enjoyed participating the the Gathering of the Guilds. The people were well informed and interested in learning about each craft-person’s technique. 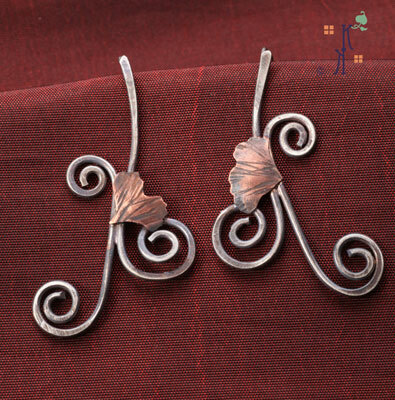 A few asked me to explain my process for creating the ginkgo leaf earrings I had. It’s nice to be able to discuss your process with interested parties. Since I described a bit of my process last weekend at the event, I thought you may enjoy that discussion in this post. Each Ginkgo leaf, in any of these pieces is different. 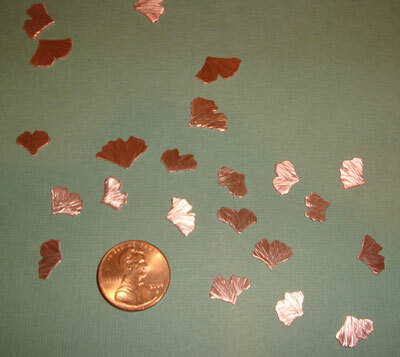 I cut out a myriad of them as I was working on earrings or pendants as you can see in this photo. Thank goodness I have that great KnewConcepts saw! With as tiny as these were, I’ll take all the tool assistance I can find. In this photo, the leaves have the line textures. The penny is shown as a point of reference for the size of the leaves. Prior to hammering line textures on these, I had sanded each piece to have a nice smooth, clean surface to accept the textures. Once the textures were applied, I took each leaf and shaped it using one of those Fretz mini-stakes I discussed in a previous Talkin’ Tools segment. For the branches, I used Sterling Silver wire. I did little light forging on the wire ends to flatten them out a bit and shape them. I soldered the branches together first and then soldered the leaves in place. The entire process of building these pieces had a series of experiments to figure out what worked best and in what sequence. It does require pre-planning and forethought before you start putting the components together. These little earrings are just fun and make me smile. They have lots of movement and are very light weight. 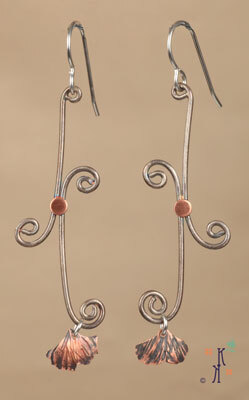 I thought you’d enjoy seeing some of the earring variations in this series. 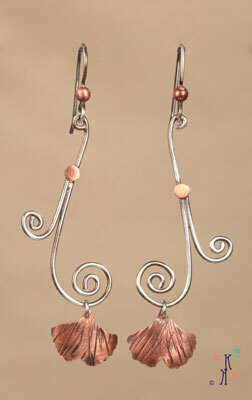 I wanted to have a variety of earring styles that would mix & match well with any of the pendants I created. I will share more of these in another post. Today, I am debuting my new series, Arts & Crafts Impressions. 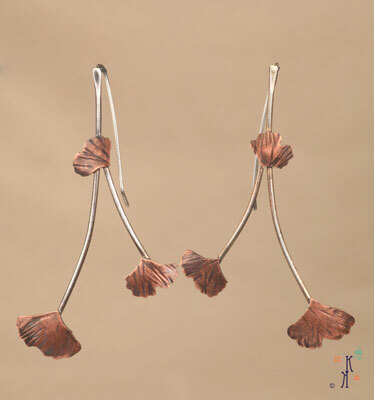 The Ginkgo Leaf Earrings pictured are the result of many experiments, learning experiences and more than a few frustrations that occurred during the creative process. All signs of personal and artistic growth in my opinion. I must say that I am very happy with the end results, along with a few other sneak peaks I will provide in this post. This weekend, I will be participating in Colorado Arts & Crafts Society’s The Gathering of the Guilds at the Boettcher Mansion in Golden, Colorado. This is the second year for this event and I am looking forward to being one of the participating artists. 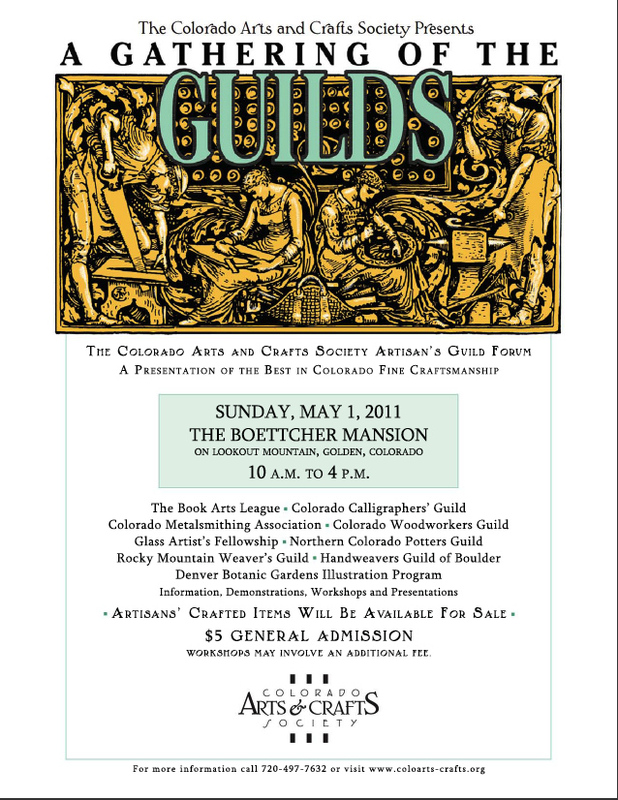 The intent of The Gathering of the Guilds is to promote the ideals and aesthetics of the Arts and Crafts Movement produced by such local guilds as the Book Arts League, Castle Clay Artists, Colorado Calligraphers’ Guild, Colorado Metalsmithing Association, Colorado Woodworkers Guild, Friends of Dard Hunter, Guild of Book Workers, Handweavers Guild of Boulder, Red Rocks School of Fine Woodworking, and the Rocky Mountain Weaver’s Guild. Designed to be an interactive event, there will be featured demonstrations, presentations and/or workshops on the best craftsmanship in and around the Rocky Mountain region. It became very important for me to explore an Arts & Crafts theme for this event. I have always loved the simplicity and elegance that the Arts & Crafts movement represented. To bring this into my work, proved to be a real design challenge for me. As I have mentioned, I certainly had my share of failures as I worked on this, yet it was worth it. I feel that I definitely experienced growth in my work and I am happy to provide a preview of some of the new art jewelry pieces that will be available on this coming Sunday, May 1st. I’d also like to provide a little background about the Boettcher Mansion. It was built in 1917 as a summer home and seasonal hunting lodge for Charles Boettcher. The 110 acre estate is in the Arts & Crafts style located in Golden, CO. I’m looking forward to seeing this historic home. 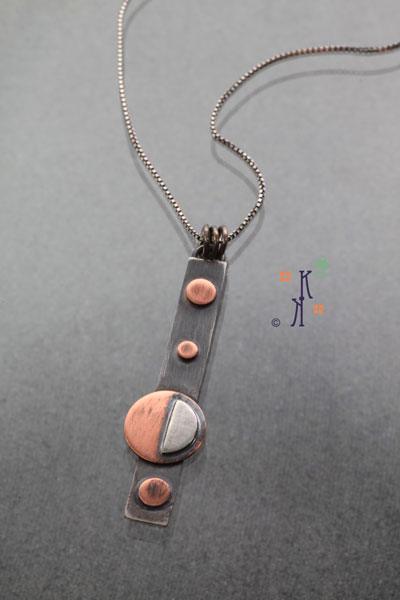 I am happy to be one of the members representing Colorado Metalsmithing Association, along with my fellow metalsmiths Lexi Erickson and Pattie Parkhurst. 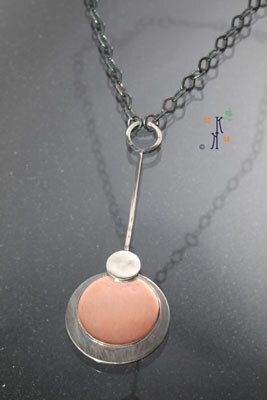 Lexi, Patty & I will be demonstrating metalsmithing techniques, along with offering some of our works for sale. The admission is $5 and the event runs from 10 AM to 4 PM on Sunday. If you are in the area, I hope you will stop and take in all this event has to offer. Here are a few of my new pieces in my new Arts & Crafts Impressions Series. I have a mixture of the circles and the Ginkgo leaves in this series. I was surprise at how difficult it was at times to create pieces with simplicity in mind. 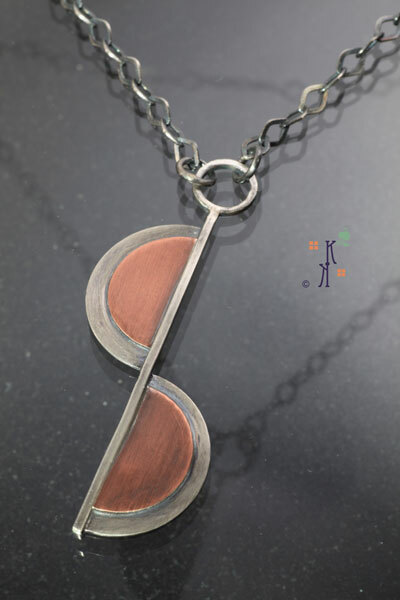 My focus for this series was to work completely in metal. 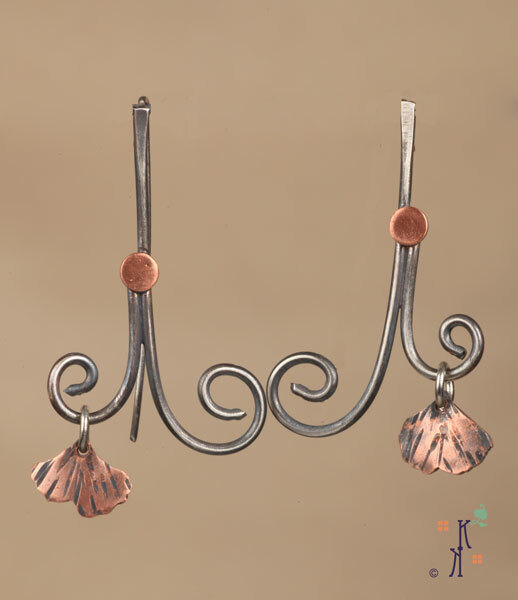 I used copper and silver combinations. It was a pleasant surprise to see how much warmth and interest copper added to the pieces. I was determined to make this series just about the metal, no stones, just metal. Again, my hat is off to Dan for the great photos he has taken of these new pieces. He really makes my work shine. I have more pieces, but I wanted to provide a sneak peak and I will feature more of these in my posts over the next few weeks. Right now I’m hoping that I’ve peaked your curiosity about this new series and if you live in the Denver area, maybe this will entice you to come see my new works along with the work of other local artists. Until next time, aspire to more as an artist and a person.